LaBarberia Institute of Hair, the Cleveland Barber College, has been recognizing our students with a monthly spotlight for their talents, ambition, and hard work. During the month of October 2018, we would like to acknowledge Rachel Vaughn. Rachel is from Shaker Heights, Ohio. After graduating high school, she realized she didn’t want to waste time and money going to college until she knew exactly what she wanted to do and which career path would be perfect for her. Rachel was introduced to barbering through her uncle, who has opening up his own barbershop. Before deciding to let her uncle cut all her hair prior a trip to Miami, Florida, Rachel often got her hair styled and cut by her own personal stylist. Rachel always looked up to her stylist because of the way she carried herself, handled her clients, and ran her own business. Talking to people is one of Rachels biggest enjoyments and since she gravitates towards people so much, she thought, maybe barbering would also be a great career for her. Rachel began looking at barber colleges around the area. 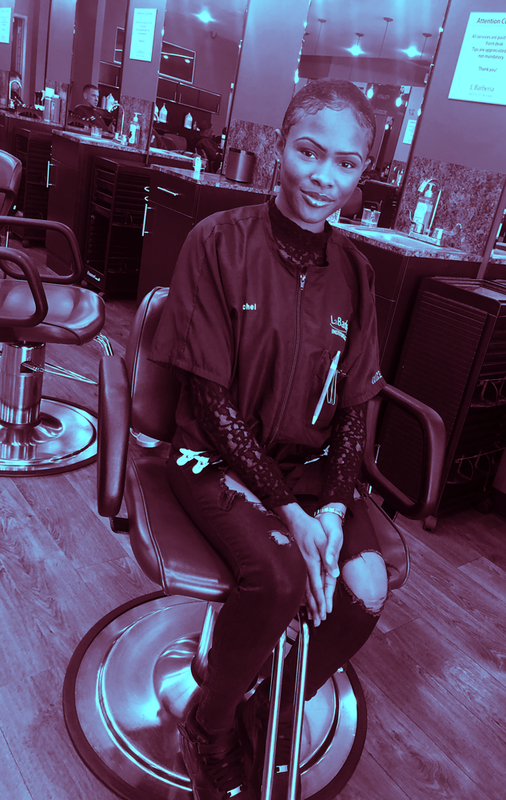 She looked at Flawless Barber Academy, in Shaker Heights, and Allstate Hairstyling & Barber College in downtown Cleveland before deciding to come to LaBarberia. She loved that what LaBarberia had to offer over all those other schools. After doing a walk through, she liked the classroom style and saw herself as a student here. She thought the students were cool and found out her friend was at LaBarberia as well! When she originally applied, she was told that she had to wait 7 weeks until the following session began due to the program being full. Happily, two days before classes started, Rachel received a call telling her about an opening in the class — she’s never looked back. Rachel currently has senior standing in the LaBarberia program and is working on the floor full-time. After she graduates from LaBarberia, she would love to find a local barbershop to work with so she can learn more from hands-on experience. She has her eye on a new shop that is being completed in the Van Aken plaza renovation named Eddy’s Barbershop. She loves the European style cuts this barbershop gives and thinks that it would be a great place to start a clientele base. © 2019 Labarberia Institute of Hair. All Rights Reserved.